A2X is designed to enable one user to manage many clients and one client to have many users. To set it up correctly there are a few very simple tips and tricks you should follow and that are outlined in this article. The free trail has no end date and payment information is not required. Before we get started, here's a brief summary of how A2X users are managed. Start with one A2X login to connect all of your Amazon client accounts. You can have multiple accounts connected to one login. Admins can invite other Users to the client's accounts (e.g client or other staff who will work on the account). A2X requires a Google account to log in, for security purposes. 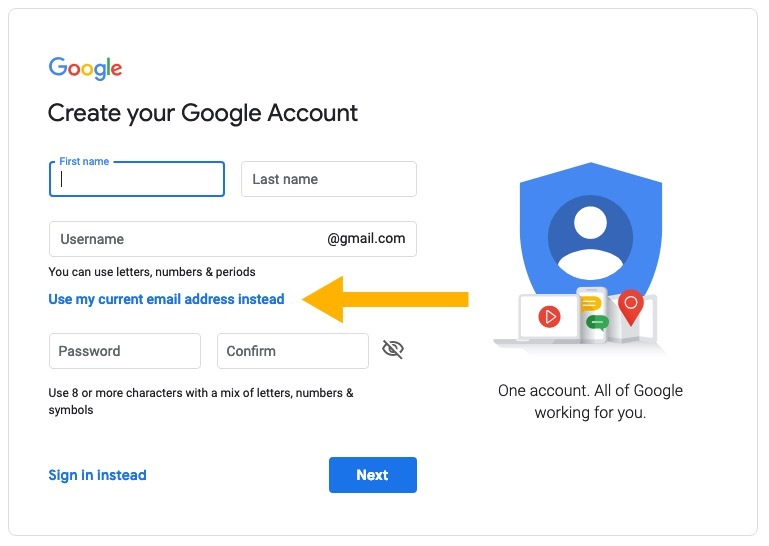 When linking your preferred email address to a google account, make sure to select 'Use my current email address' (see screenshot below). Decide who in the firm will set up the A2X subscriptions and thus becomes the Admin user. Then, click HERE to start your free trail. The free trail has no end date and payment information is not required. You may be prompted to create a google account. For help setting up a Google account, read this article HERE. Then, click the on "Create New Account" button. That's it! Step 1 is now complete, and you've just created an A2X account for your first client. You'll be adding more client accounts to A2X shortly. In order to easily identify the various accounts, let's name each one as we create them. Don't forget to add your Partner Code to qualify for your discounts. Add Partner Code: While you're in the accounts page, scroll to the bottom and enter your Partner Code here. Step 2 is complete! On to the last step! Do you have the client's login for Amazon? If not, simply send your Amazon client an email invitation to connect. On your A2X home page, click "Connect to Amazon". Enter your client's email address and select the Amazon marketplace. You will receive an email confirmation once the Amazon account has been connected! For more information on the email invite, refer to this article HERE. Connect A2X to the client's Xero or QuickBooks Online account. This account will be either on your firm practice list or your client invites you to it. Refer to Article Connect to our accounting system. Please Note: If your client has multiple Amazon accounts and needs to share the A2X connections with Xero or QuickBooks Online account, refer to article Connect Multiple A2X Accounts to Xero or QuickBooks Online for more information. Add your next client to A2X. Start by clicking on the blue button in the upper right corner of your screen and choose "Create New Account". Follow the same 3 steps! Once you start the subscription, A2X can fetch your client's Amazon settlements. Go to A2X > Settings > Subscriptions and choose the subscription that is right for your client. Once your clients have been added to A2X, let's begin mapping the Accounts and Taxes. 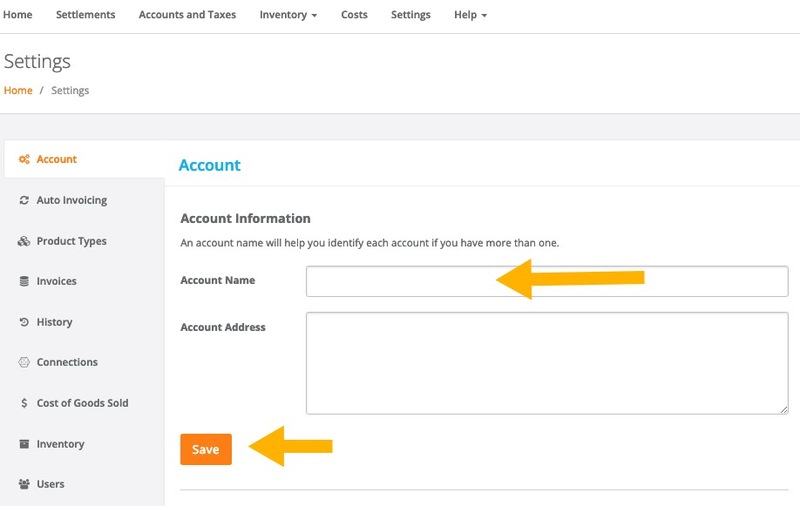 Try our default accounts feature and have A2X create the accounts in QBO or Xero, or use use your own Chart of Accounts. Read this article on Set up Account and Tax Mapping for more information. You can easily copy the mapping from one client's account to another. Did you know A2X has inventory reports available? Read this article HERE to learn more. Send your first settlement to Xero or Quickbooks! Once you're happy with the initial setup, try sending your first invoice. For more information, read HERE. You can easily make changes and adjustments to your A2X set up. Please contact us if you need more support on how to set up A2X. We love to help!